Inspired to cook the dish after watching it made at a recent cooking demo presented by Slow Food OC, Duc and I took to the supermarket to gather ingredients for a healthy dish. 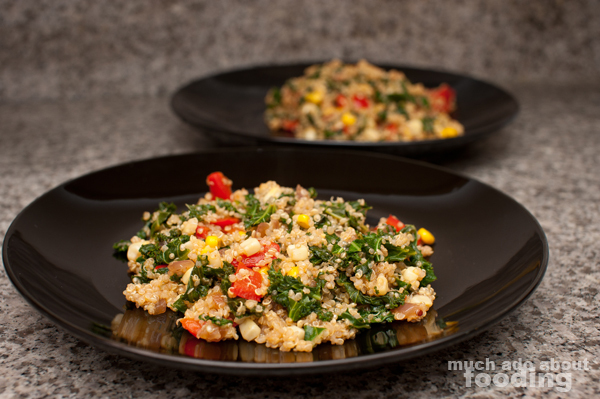 Theirs was a one-pot quinoa kale dish that we created similarly but with just a few adjustments of our own. I know I haven't been posting recipes lately but stayed tuned for tomorrow's announcement post about a cool idea I had to encourage more of these kinds of posts! Also, this was my first foray into using Duc's camera to take pictures of my food, and I daresay that some of the pictures came out very well! 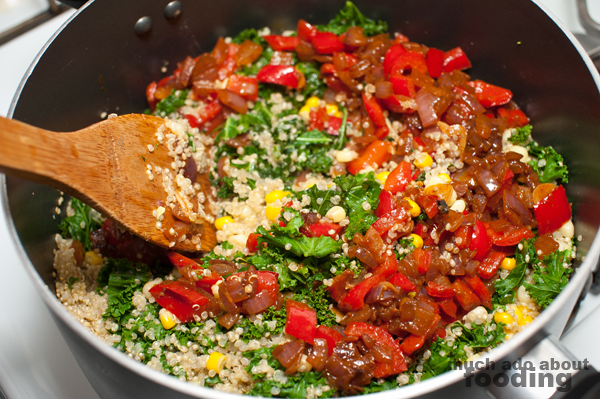 The first thing you want to do is start your quinoa as it can take a little while to cook thoroughly. 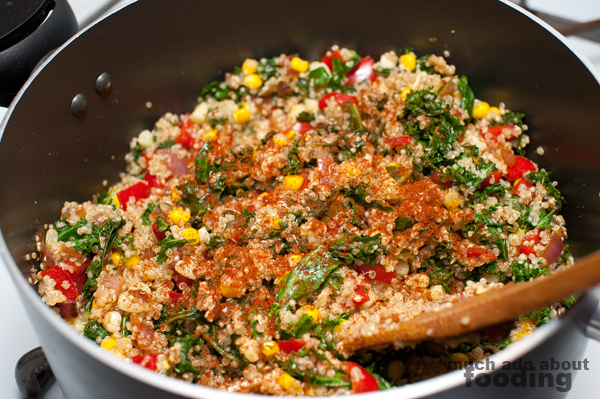 Bring your chicken broth to a boil and add in your quinoa. If later on you find that there wasn't enough liquid, you can add water. 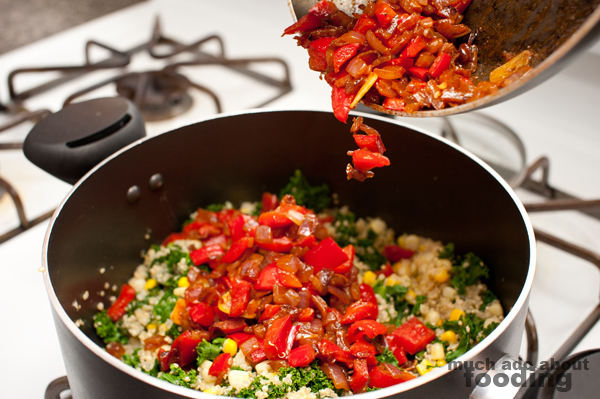 Cover the pot and move onto your vegetables. Chop and slice as needed! 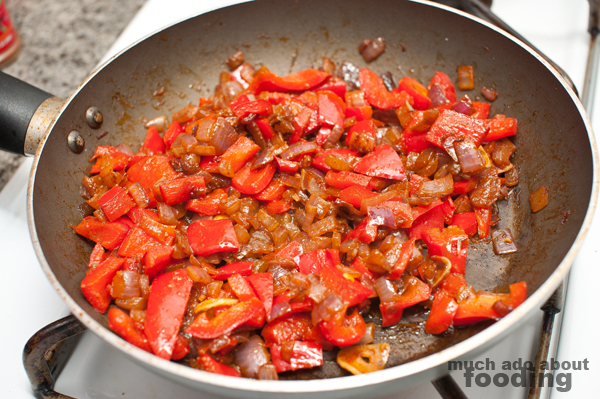 In a large skillet, heat oil before adding your diced red onions. Cook for a few minutes before adding in the red pepper. You want to bring the onions to a point when they turn translucent. Add in your sliced garlic and paprika. Stir for another minute or two before turning off the heat. 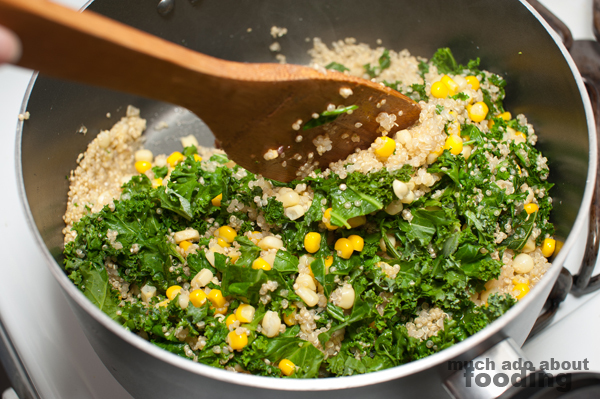 In your pot with the quinoa, add in your kale. Let cook for approximately 5 minutes before adding in the corn and removing the lid. Stir together the contents of the pot. You will know when the quinoa is done when the little "tails" inside spring out. The kale will soften but taste a piece if you want to see what texture it's at. Mix in the contents from the skillet and squirt on the lime juice. Add more paprika if desired. Serve hot or cold - either way, enjoy!